Ready to roll? Rent one of our awesome fat tire bikes or fun cargo bikes to make the most of your Northern Michigan day. Whether riding a sandy trail or carting some serious stuff, our rental fleet will have you getting from point A to point B in the most fun way possible. Due to the large size and low pressure of their tires, fat tire bikes ‘float’ over the ground surface and maintain greater traction on rough, wet and slippery terrain. This allows fat tire bikes to go places that are either too difficult or impossible on traditional bikes. 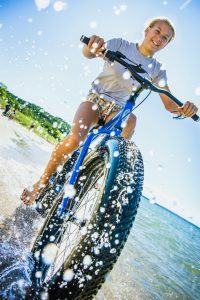 Our fat tire bike rentals are perfect for riding on the beach, off-road or simply cruising the streets of Empire. Our rad bikes are also perfect for touring the Sleeping Bear Heritage Trail! 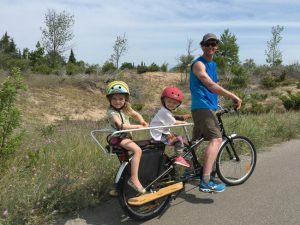 To enjoy the heritage trail with your family, or to bring your goodies to the beach to avoid paying for parking, throw your gear and children on a cargo bike. 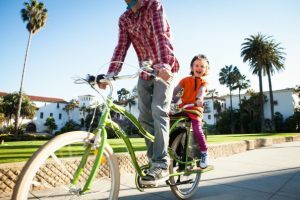 The Mundo bikes have room for boards, kids, picnic supplies, towels and other necessities for a fun-filled day. We also carry the boda boda Yuba bikes that are geared towards the individual with fewer supplies. Speaking of gears, these bikes have 21 gears. TWENTY-ONE. You will not have any problem peddling around these cruisers, no matter what amount of gear you’ve got strapped to the sides or the back!